Transformers, despite how erratically it was broadcast on UK terrestrial TV – all I had – was my favourite programme as a child. The movie, which bridged the two major eras of the classic television show, is as much of a cult classic as it’s possible to get, and the quintessentially 80s rock soundtrack is oft-played at nostalgic and geeky events. 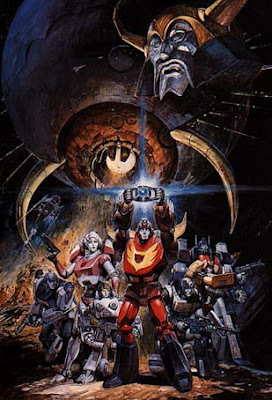 Older commentators in particular have been hostile to this film, objecting to Transformers fundamentally because it existed to sell toys, and the 1986 film can be interpreted as an old toy line being killed off so that kids would want to buy newer ones. But while there is undoubtedly truth to this, it is also an oversimplification: part of the cultural impact of the film was its brutal killing-off of favourite characters, and if anything, it was the Autobots who ended up as part of the bodycount who ended up being the most desired toys, even when like Ironhide and Ratchet, theirs were hopelessly inadequate – those two came with no heads. The film, with its sprawling cast and multiple locales, is difficult for the uninitiated. Set a generation after the beginning of the original series, it comes after a time-skip that unsettles even those familiar with the world of Transformers. The identifiable human character Spike now has a son, Daniel, who is friends with a plethora of transformers who have apparently come into being since the end of the series, notably Hot Rod, Springer, Arcee and Kup. The Autobots have set up a permanent base on Earth, Autobot City, but the Decepticons have control of the Transformers’ planet Cybertron. A supply run to Earth is ambushed and most of the leading Autobots from the first two series are shot down in pretty violent fashion, robotic heroes allowing for more brutal animation than could have been possible with humans. A lot of people will tell you they were traumatised as children by this scene, but I must confess it didn’t really affect me: I was too young, I suppose, and the likes of Prowl and Brawn being killed didn’t affect me too much when they were still being shown in the series when I tuned in – although I was amused enough when I first got online by the controversy around Brawn’s easy death to buy a T-shirt referencing it, like the complete and utter nerd I am. The Decepticons infiltrate Autobot City and are just barely repelled when Optimus Prime arrives with reinforcements. Both sides have sustained heavy casualties, and thus begins a new era, with the Autobots searching for their new, worthy leader and the Decepticons rebuilt by a sinister force that has an agenda of its own. Animated by Toei at the beginning of what I suppose should be called their silver age, a lot of money has obviously gone into making this look slick – it looks much smoother and more polished than, say, the first Dragonball episodes or the last Yamato film. Being a very masculine effort – lots of explosions, big robots and action – there’s a temptation to dismiss the animation as immature, but that would be unfair: some of the shots are ambitious, clever and well-realised: witness Unicron transforming or Prime’s big arrival to the war. The amount of money changing hands here is also reflected in the voice cast: Leonard Nimoy’s gravely tones sound great, Eric Idle sounds like he’s enjoying the performance more than anything he’s done since early Python and the film was the last Orson Welles worked on. Welles, a true legend of the screen – some have portrayed this as a terrible fall from grace, such a legend in his own words playing ‘a toy’, but the role is as memorable as it is short, and I doubt that he’d have been horribly embarrassed by it had he lived on for another decade. Transformers: The Movie is not supposed to be clever or innovative. But it is both brave and powerful. It is emotionally heavy-hitting without coming over as exploitative: there’s something impressive about both the drawn-out death of a major character and of poor Wheeljack just being a random dead body glimpsed for a second at most. On the other hand, Huffer doesn’t even get that, which is a disappointment. The film meanders around its saggy middle section, with underwater sequences really not necessary overall, but the big payoff is worth it. You've got the touch....you've got the POWEEEEERRRRRRRRRRR!!!! ぱにぽにだっしゅ! / Pani Poni Dasshu!